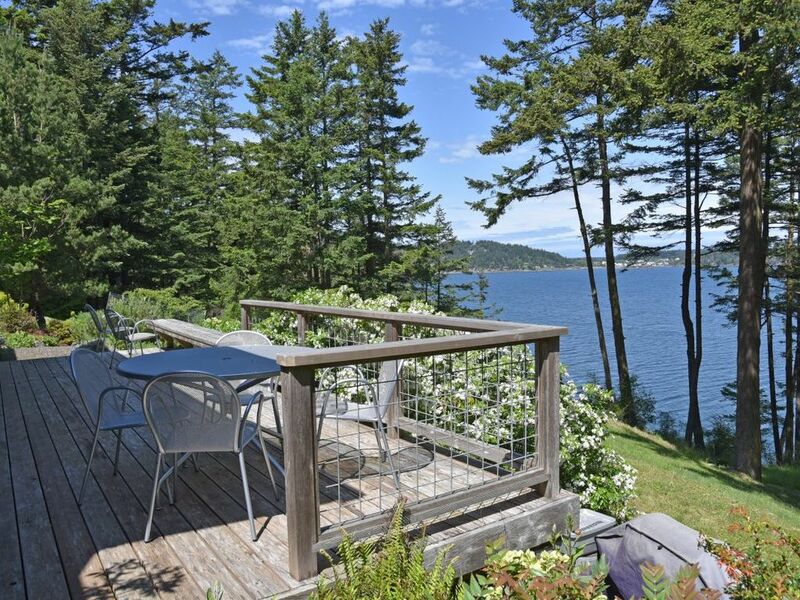 Enjoy the delightful accommodations at Casa Verde on Washington's Beautiful Orcas Island. Designed and built in 2003, this 3 Bedroom 2 Bath home located in a secluded and quiet wooded setting on a highbank waterfront acre lot overlooking beautiful East Sound. Orcas Island is considered to be the most spectacular of the San Juan Islands and with over 36,000 acres it is also the largest. Orcas has been a favorite for generations of visitors from all over the world. The population is widely spread out, adding to its feeling of peaceful, tranquil privacy. Relax and admire the beautiful water view of Eastsound, or catch the sun rising over Mt. Constitution. Conveniently located approximately 4 miles from Eastsound Village and 7 miles from the Orcas Ferry Landing. Casa Verde is surrounded by firs, maples and cedars providing a nice area to walk and enjoy the peaceful setting that is Orcas Island. Sit among the trees, listen to the birds and admire the view on the large deck with dining table and chairs overlooking beautiful East Sound.There are two large seasonal hammocks (May thru Sept) hanging in the giant cedars at water’s edge for the ultimate of peaceful reading, listening, or watching nature at its best. This is a high-bank waterfront home with no beach access. Other amenities include a Propane BBQ outside, Gas fireplace, CD / DVD player, TV with DIRECTV, Washer and Dryer. And if your work has to come along . . . plug right into the desk area with its telephone and an internet connection for your laptop. Casa Verde features an open floor plan with lots of windows and cork flooring. The master bedroom provides an incredibly comfortable King size bed. There is an additional bedroom with a Queen Bed and an office with a queen futon platform bed. Casa Verde is fully furnished with all the amenities of home. PLEASE BE ADVISED. Parties are not permitted under any circumstances and the guest occupancy limit will be strictly enforced during your stay. NO CHILDREN ALLOWED UNDER THE AGE OF SIX (6) YEARS DUE TO TERRAIN OF PROPERTY. Northwest Island Escapes makes every effort to provide, and provide timely maintenance all the amenities listed in this property description. However, at times, due to events out of our control, these services may not be as fast or reliable as our guests are used to on the mainland. Please Read your contract for important additional information about the availability of these services. Our family has been visiting the San Juan Islands since 1978 when some good friends bought a farmhouse on Lopez Island and we knew someday we would figure a way to come back more often. Finally, after building a small cabin in 2000 on Orcas Island, we sold that, and then designed and built Casa Verde and have been enjoying yearround visits ever since! We love the Pacific Northwest salt water, kelp and cedar smells and as you can tell from our photo, have learned boating! This beautiful home had everything you could want in an island getaway. The kitchen is a dream and is incredibly well equipped down to the last measuring spoon. Our time in Casa Verde on Orcas far surpassed our (already high) expectations. The home was beautiful, the location was perfect, and all the amenities were as described. Not only would recommend, but will likely visit/stay again! We wish we could live there. Beautiful, clean, fabulous windows and views. We had been at another property that was rundown and the rental company was wonderful to work with and got us to this home which we would come back to every year. Casa Verde was just what the doctor ordered. Beautiful, peaceful and comfortable. The property is amazing with excellent views back to the town of Eastsound, yet seemingly miles removed. Casa Verde was truly perfect in every way - the ideal backdrop to an unforgettable vacation! Every little detail was well attended to; it was cozy, homey, scenic, beautiful, well-stocked, great location.. I could go on and on. I dream about the day we get to return! Two large hammocks hanging in the giant cedars at waters edge.